Recently, a website called Wordle debuted. What is Wordle? You can think of it as similar to a tag cloud, except Wordle analyzes words, not tags. You can see people’s blog Wordles on FriendFeed. Wordles are only graphics – you can’t use them for navigation. A nice use of Wordles is that you can quickly pick up the pulse of a website. Higher word counts show up as larger fonts, the way tag clouds do. I wondered what enterprise 2.0 vendors are talking about now. We’re a couple years into the introduction of the term “enterprise 2.0“, made popular by Harvard professor Andrew McAfee. The market is still young, but a decent number of companies have entered the space. Given that they’re selling to corporate customers every day, I was curious as to how their message has evolved. I focused on these pages for the vendors: home page, product pages, “about” page. Let’s see what’s going on out there. For the Wordle, I removed company and product names to keep it focused on themes. So looking at this Wordle, what do we see? Content and information get a lot of play, while knowledge shows up less often in the messaging. That seems about right, doesn’t it? Knowledge is information that you’ve internalized. Well, enterprise 2.0 should help people with that task. Still, it does seem that the focus is on the inputs (content, information), not the outcome (knowledge). Enterprise search is catching on with enterprises. If search is the leading use case, what’s the next one? Collaboration. Very much in keeping with the web 2.0 ethos. After that, we see learn and networking as important use cases. Note that RSS is only slightly bigger than email. A good acknowledgment of what the leading application in the enterprise continues to be. Social as a top word is no surprise. Isn’t that the premise? Community falls in a similar vein. Two other words I found interesting: can and new. Can is very much in keeping with the spirit of enterprise 2.0. Companies continue along the adoption curve, but there’s lot of opportunity out there. So emphasizing what you can do is in keeping with the state of the market. New has a similar vibe. The sector is continually iterating and innovating. 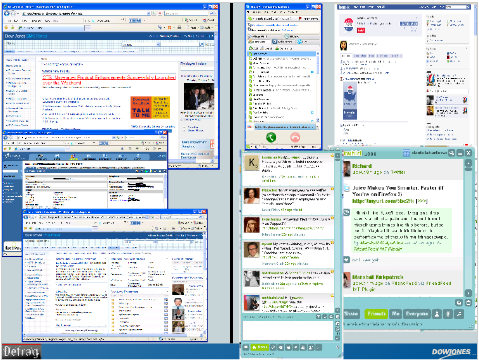 Web 2.0 moves fast, and vendors have to be nimble to keep up. 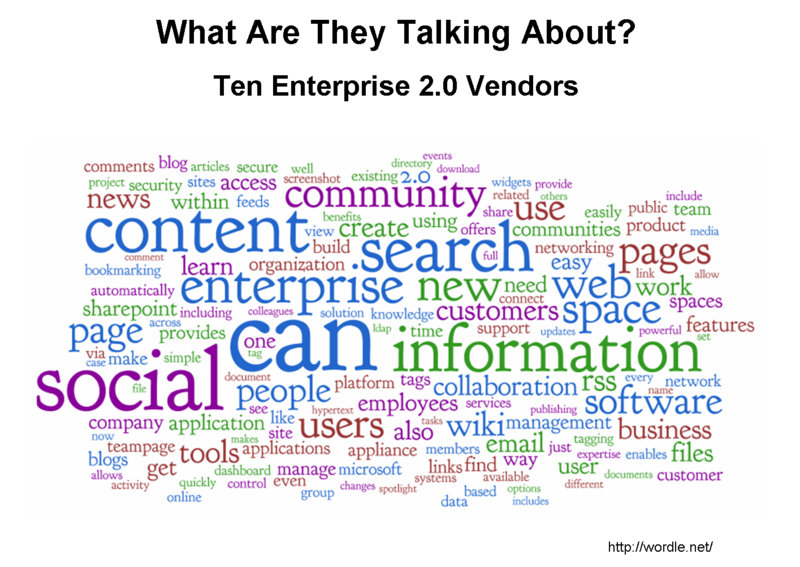 Companies’ use of SharePoint and the importance of Microsoft to the enterprise ecosystem is seen in the Wordle. There are probably other interesting things to be gleaned from this Wordle. What do you see?